Heading for half a million comments | Watts Up With That? Between the hundreds of spam comments we get daily, and regular comments, I’d just like to say thanks to the moderation team. It doesn’t much mean anything, just something fun. Well this is one closer LOL. Well, since I’ve had a day’s worth of Irish Cream coffee and am real chatty, maybe it will be me! If Ican keept myh witss abouytt mee fore a bitt. And yes, the mods do a great job of keeping the discussion open and civil. Merry Christmas and may you be blessed in the coming year. Merry Christmas, a big Thank You to Anthony and all of the moderators! Best wishes for xmas and a very interesting year to come no doubt. Clearly I’ve got too much in the Xmas spirit alweady and can’t spell ma wodes properiley in my last post (LOL). Oh! and Joyeux Fêtes Bon Nouvel Ans to all at WUWT. A great readership and great moderators, and thanks to Anthony for this brilliant blog! Congrats on your eventual 500K. May it bring peace and prosperity to one and all. Good job mods and Merry Christmas to everyone here. on which skeptics all fired their shots. With the best wishes for a Merry Christmas and a Happy New Year! The last month here in central southern Norway has been on average 7,5 degrees C below average for the last so-and-so decades. I feel cheated. I looked forward to the global warming! Well, truth before joy, then. Merry Christmas and I hope you can keep warm this winter. Wouldn’t it be ironic if it was George Monbiot who hit the half mil marker. Well it wont be me with the 500,000’th comment because I could fall into a bucket of T*ts and still come out sucking my thumb. Did I just say T*ts and fall foul of moderation? Merry Christmas the WUWT team. Congratulations on running such a great site with such well-informed commenters. Obviously with this excessive bandwidth usage, you will need to be throttled down… in the interest of net neutrality of course. Merry Christmas to Anthony and the mod team! Just went round the house and grounds to make sure all the old horseshoes were turned up for luck. One in particular. An old workhorse shoe. It measures nearly 7 1/2 inches across its widest part. There is an old snaffle bit to match that measures 7 inches across. Now that’s a big horse with a big mouth. Wishing that all your horseshoes are turned up this holiday season. Merry Christmas. Job well done, Anthony! Is that a half a million in real numbers or Michael Mann numbers? Merrick, I was number 2. Been called that too. But only if you flame my already red head. OMG, now all of us will be up all night! Congratulations on having the best website on the internet! Merry Christmas , everyone . Does anyone want a good eggnog recipe ? If you make it tomorrow , it’ll be ok for Christmas – it really needs to sit for a couple of days to mellow . Let me know within an hour , as I’m up to my ears with last minute stuff . Fantastic job on getting 500,000 comments! I’ve read a lot of them and I think you’re in good company of many intelligent people from all walks of life! I guess I’ll have to refrain from posting comments in the next 24 hours. Wouldn’t want to post something dumb and have it be the 500,000th comment. Except if Anthony decides to have a Seasons Greeting thread. Then I’ll be willing to post a Happy Holidays, etc., to all those who have taken the time to read my posts this year, and to all who have commented here. Well, here’s my contribution, however small. Merry Christmas and Happy New Year Anthony and all the moderators and loads of appreciation for all the work that you do. This site is terrific and I honestly don’t go for more than two days without visiting it. Thanks to the Moderators for keeping the discussion open and polite. Great site! There is always something interesting to check out. There is a real effort to include scientific papers that are pertinent regardless of the data or conclusion. Appreciate the efforts of the contributors to explain the nuisances of the issues and the analysis. Hope things are going well for you Anthony. I’m too cold to post right now! I’ll say it because I know they won’t. Thank you, Rev, for all your incredibly gifted work. Best Christmas wishes to you, yours, the mods, and all those little people who chimed in half a million comments. And to the trolls, who helped with the count if not the content. A happy Christmas to you, your family, the mods and the readers (including the trolls). Merry Christmas and a prosperous 2011! I don’t know, Anthony, all these comments might have contributed mightily to global warming, what with all the breathing in and out whilst we sit in front of our computer screens contemplating your posts. Or at least that theory makes about as much sense as some of those propagated by the warm-mongers. In any event, congratulations are in order, and I can’t think of a more well-deserved blog anywhere on the interwebs. Many thanks for all the hard work Anthony, moderators and guest writers. WUWT is my number One site for 2010, and fair to say well deserves the top Science Blog Award too. Thanks to Links on this site, I have a better idea of what real science actually looks like, something entirely absent on TV or in those deplorable Rags – No Scientist, Socialist American, Forgetful Geographic, and Time ( its red for a reason). While you enjoy the Hydrogen Dioxide garnish in the Northern Hemisphere, we in the southern will actually have a BBQ summer Christmas, with real BBQ’s and 100% Natural Variability induced Sunshine – via that big spotless incandescent bulb in the sky – which everyone knows in no ways contributes to Global ClimoDisruptoCooloWarming. All the Best from peoples republic of CarbonoStan – formally New Zealand – now a subsidiary of Soros & Koch – a fully incorporated Corporate Pirate associate of WikiBleats Society for the prevention of Humanity. My blog’s been up for years and I’ve got no comments at all — except for one I did myself under another name. Using advanced computer models I expect Gavin Schmidt to win. Thank you WUWT. Anthony, nice to meet you briefly in Australia. We are sopping wet here, and expecting a king tide of 2.6 m at 11:24 am in Brisbane. Gavin’s blog would have had this many but he deleted 400,000 of them. lol, John A. – JINX! Merry Christmas the lot of you…can I have my prize now please? Well, Christmas dinner awaits the purchase of groceries, and my boyfriend is waiting for me at the Tavern. Ale waits for no Irish woman worth a damn. So it looks like I won’t be in the running. Not that I’m upset. Love this blog to death and am just thrilled to see my little additions mentioned at all. I’ll tip a frothy pint for all the mods, Anthony, and commenters. See ya in the morning. Make that noon. If I remember correctly, I was directed to this site by Christopher Booker long before ClimateGate appeared. I’ve been a regular reader and occasional writer ever since. It is a great site, and I commend it for regular and frequent postings, fair treatment of those of the opposite persuasion and good maintenance of reasonable standards of politeness. More importantly, it reports on key technical and political revelations. I also thank Anthony for his frequent intervention with words of fairness and wisdom. As I read my own words I squirm a bit because I’m normally ultra critical. WUWT is a great site, it has contributed much to the case for realistic climate concern. I’m a big fan of this site and hope for the day when Anthony comes to Toronto to do a tandem presentation with M&M. With your current weather, if you left Cali now, you could probably paddle here. It needs to be something profound. Deep. Serious. So did you buy those red shoes after all that you were agonising about a year or two ago? The world waits. Threaded comments, as they are at CA, would be good though. It’s hard to have an actual discussion on various points when there’s just one big wall of them. Just imho. I’m a long standing fan of WUWT and I deeply appreciate the efforts of the Mods and Anthony in keeping this site possibly the best I have ever visited: it is informative, educational, humorous and accessible to all, even those without PhDs in esoteric disciplines. a fiscally successful, personally fulfilling, and medically uncomplicated recognition of the onset of the generally accepted calendar year, but not without due respect for the calendars of choice of other cultures, whose contributions to civilisation are also acknowledged, and without regard to race, creed, colour, age, physical ability, religious belief, choice of computer platform, or sexual orientation. objective analysis of the ice core data is this: we are at the beginning of ~ 75,000 years of rapid cooling. For a layman like me WUWT really has helped me strengthen my opinion on AGW and helped open channels of info on climate change, I looked into this more after seeing a very well articulated post a while back on prison planet and since then you’ve been on my BB social feed. I’m fairly new here, having found my way via Twitter earlier this year; in fact, this may be my first comment. Anyway, this has become one of my favorite sites, one that I read and retweet often throughout the day. Thanks. For a minute, I thought you only had one spam out of all of those, and weren’t sharing. Having our family traditional Kiwi neighbours pudding on xmas day – its sweet and delicious, so all you sweet tooths should give it a try. Merry Xmas all and specially to Anthony Watts and his mod team. 1 desert spoon gelatin dissolved in 1 tablespoon cold water then one tablespoon of hot water. Separate eggs put yolks in pot. Add cornflour sugar milk vanilla and whisk. Heat gently and stir until thickens, then let cool. Beat egg white stiff. In another pot boil golden syrup and as boiling beat into the stiff egg whites along with gelatin. When custard cooled fold into egg whites. Decorate with whatever whipped cream etc. Leave to set – can make it the day before. It’s all a conspiracy I tell you, hello anyone out there……. No doubt at the steady rate of 1000/month until last November when it rose exponentially. Now, if the comment numbers are anything to go by none of us are getting the $500,000. It’s like some Californian version of a UK phone competition. I feel betrayed, I had plans for my loot and now Xmas will be as dull as ever. I will not return until morning. if we hit the magic number, what do we win? A weather station? An autographed Roy Spencer book? An autographed 8×10 photo of Tony W? A zip file of of all the climategate emails? 500.000th comment is no different than 499.999th comment or 500.001st. I don’t want nothing whatsoever to do with this artificial excitement generation. Bah! Anthony: I took the opportunity today to pay my dues and flung a meager hundred your way. Like so many others, I can’t go a day without visiting my favorite blog and getting unparalleled information and a few chuckles. I know the sacrifice you make to keep the blog going and at such a high standard to boot! Thank you for the education and the laughs. All the best to you, the mods and our entire WUWT family. The image want to depict right now, but it doesn’t. It is, in fact, I have recently, just now, deduced, one of the cheapest images available, the static ones. Hello, but the rest of us are living in the 2010 era still, and are, thus, hungry for the dynamo of information. Only 500 000 ? Probably cause your content is engrossing and the topic often beyond my understanding to comment on, or throughly laid out and explained requiring little comment.Merry Christmas to all. Thank you to all who keep this site up and running and so interesting. May science be rediscovered in the mass media soon. Thank you Anthony, CTM and the other mods and rockers – a wonderful job… Please keep up the good work – I would have a hard job weaning myself from the addiction of reading your blog several times a day! Just above this block where I type this is a bold heading Leave a Reply, so occasionally I do – leave a reply. I’m sure it will be James Hansen he’s here so much. Merry Christmas to you Anthony, your Family, and to the moderators, get job over the years and keep up the great work. Congratulations, Anthony. It’s a great site, and I use information I find here in my classes to help students at least try looking at things from a perspective other than the officially approved one. 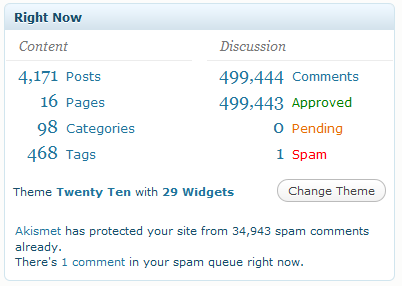 Thanks to all half million comments which do much heavy lifting in the education of readers like me. Here is to the next 500,000 comments… This site is a must read every day. The breadth and depth of comments by the readers here, makes it worth every minute spent here. When the pacific storm belt fires up in the winter time and drowns my local area with 80+ inches of rain on average, this site helps me make it through the boredom. I’m not going to post until someone does it. Nice one, indeed! I copied it, Stephen. I will pass it on, as long as we are permitted humor. congrats anthony and thanx for allowing comments for those like myself without a scientific education. visiting your site has increased my understanding of the complex subject of climate, for which i am grateful. seasons greetings to u and your family – trust mrs. watts is doing well – and thanx to mods and guest writers. If it’s Osama Bin Laden, best to keep it to yourself. To everybody that is keeping the in this website constructive dialouge going. From zero to 64 million views and half a million comments in only four years! Congratulations, Anthony and Mods! A prestigious event, we ALL win when you reach 0.5 million comments! I hope the excessive di-hydrogen-oxide out in California hasn’t bothered you much….pictures from San Diego are rather amazing!! Climate disruption, clearly. Merry Christmas, all and to Charles for putting up with me and Leif. That was the first post to receive no comments. There were as many as 46 others that year to be uncommented upon. I just wanted to say, out of all the comments ever on this blog, this is certainly one of them. Merry Christmas, Anthony, and the best to your family! This comment is tele-connected to number 500,000!!! Thank you Anthony, the team and all the contributors, who have made this an oasis of sanity and fun in the turbulent and sometimes very scary times in the rise of global hot air from AGWScience supporters. I’m so glad I found you. A merry Christmas to one and all and peace to all mankind. Thanks for this outstanding site, Anthony, and for all your work keeping the amazing science reports coming! Thanks, moderators, for keeping us all to the straight and narrow while allowing all diverse view points to be heard (ahem, ‘read’). Thanks, guest posters, for your stimulating contributions, with extra stars going to the one and only Willis Eschenbach! Thanks everyone for your comments, videos, links and witticisms. I’ve been reading here for two years now, with the odd comment thrown in here and there – and I am very grateful for all I’ve learned here. A Merry Christmas to all of you, and a Happy New Year! But those differ slightly from the initial totals at the top of the page. WUWT? Two pair! Mid heels. A dark cherry red. One pair with a buckle on the side, and the other with the strap behind the heel (aka sling backs). To quote from the movie “Chocolat”, “Why do you have to wear red shoes?” Because I can. Vianne Rocher: Anouk, just tell me what happened. Anouk Rocher: Are you Satan’s helper? Vianne Rocher: Well, it… it’s not easy, being different. Anouk Rocher: Why can’t we go to church? Vianne Rocher: Well, you can if you want… but it won’t make things easier. Anouk Rocher: Why can’t you wear black shoes like the other mothers? What’s not to like about this movie? It has lots of chocolate and red shoes in it. I like the book and film of Chocolat. The author is one of my favourites. At least it’s paid spam! It’s selling offensive nonsense, of course. Pam, why don’t you buy an ad directly here offering to sell glossies of yourself posing in the red shoes (and nothing else)? If the site gets a cut, you and Anthony would both make out like bandits! Brian H, actually, me and red shoes with nothing else would be 54 year old offensive nonsense. 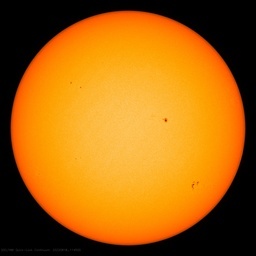 Maybe you can single-handedly stop global cooling!